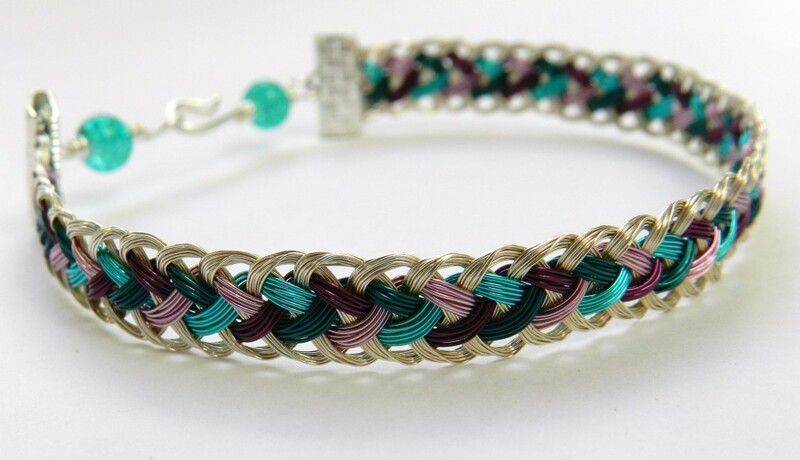 Wire is used to great effect in this flat bracelet and it is quick and simple to finish off with ribbon ends. Wire is not pulled tight in the same way that cords and yarns are, so the braid looks very different. Half Round Braid produces a wide braid with lacy, scalloped edges. – 4 warps of coloured wire in slots 8, 16, 17 and 25. – Warning: wire can damage the foam disk if the wire is pulled too tightly in the slots.